The Milne Bay area is a narrow strip of land between the mountains and the sea ranging in width from a few hundred metres to 3 kilometres at its widest point, perpetually soggy with sago and mangrove swamps. It is notorious for torrential rain and during World War II was a malarial pest hole. The entrance to the bay is 11 kilometres wide and flows west for 32 kilometres. General MacArthur decided to establish an air base there, and on 25 June, 1942, elements of 55th Battalion AMF, landed and four days later U.S. anti-aircraft batteries and one company of an engineer battalion arrived. Their task was to construct an airstrip at Gili Gili by 20 July. This force was strengthened on 11 July by “Milne Force” under Brigadier John Field which comprised the 9th, 25th and 61st Battalions of the 7th Brigade AMF, plus anti-tank and anti-aircraft artillery and 24th Field Company of engineers.The elements of the 55th Battalion then returned to Port Moresby. As soon as the strip was ready an Australian fighter squadron would be provided. Brigadier Field, an AIF veteran, was a mechanical engineer, and soon after his arrival was instructed to construct a second airstrip choosing Waigani on the western shore. New roads were built and bridges across many creeks strengthened and a wharf constructed south-east of Gili Gili. The first air raid was on 4 August when aircraft of the 75th and 76th Squadrons were strafed. These had arrived on 25 July and were commanded by Squadron Leaders L.D.Jackson and P.Turnbull, the group also included Squadron Leader “Bluey” Truscott who had won fame in RAF Fighter Command in 1941. There was a second raid on 11 August. 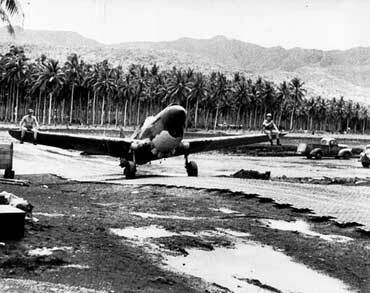 Work then began on a third airstrip by the 43rd U.S. Engineer Regiment, which had landed on 7 August, between Gili Gili and Kilbaro. Brigadier Field had by then dispersed his ground troops strategically. By 21 August Brigadier G.F.Wootten’s 18th Brigade, veterans of Tobruk, had landed with 9 Battery of the 2/5th Field Regiment. On 22 August Major General Clowes, took command of “Milne Force” and re-positioned the infantry battalions, the main dispositions covering from Gili Gili along the four metre wide track to KB Mission and then on to Ahioma. On 24 August seven enemy assault barges landed on the south-west of Goodenough Island which were promptly destroyed by Australian aircraft. The Japanese were to rue the loss of these stranded troops. Enemy troops landed at 1am on 26 August forcing the withdrawal of D Company of 61st Battalion from Ahioma, and then moved west to attack B Company with infantry and two tanks. 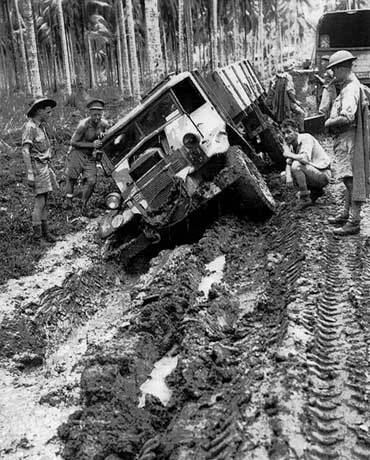 B Company was reinforced and attacked through the ceaseless mud with artillery and air support, gaining 800 metres, but Japanese pressure was increased and the Australians were forced to withdraw back to KB Mission and then to the Gama River in the early hours of 27 August. Losses in 61st Battalion had been 15 killed, 14 wounded and some missing, and in 25th Battalion, 3 killed and 2 missing. At 2pm, 2/10th Battalion AIF relieved 61st Battalion advancing to the Mission. At 8pm the Japanese successfully counter attacked with their two tanks, against which sticky bombs were ineffective having been made useless by dampness, and Lieutenant Colonel Dobbs was forced to withdraw to the vicinity of No.3 strip arriving there on 30 August. The 2/10th Battalion had lost 43 killed and 26 wounded. Now confronting the Japanese was the 25th Battalion on the south-east corner of No.3 strip but the 2/12th Battalion moved forward on 28 August. On the night of 29 August more Japanese were landed on the north shore. At 3 am on 31 August, the enemy began a strong attack against No.3 strip but were repulsed by the 61st and 25th Militia Battalions and the 2/12th Battalion with heavy losses. Counter attacking quickly the 2/12th Battalion reached KB Mission by 5pm on 1 September. A and C Companies of 9th Battalion moved forward to support both flanks probably killing more than 100 enemy. The 2/12th Battalion patrolled a kilometre east of the Mission. One company from 61st and 25th Battalions relieved the rear elements of 2/12th Battalion at the Gama River thus increasing the strength of the AIF Battalion. On 3 September they gained considerable ground and were joined by two companies of the 2/9th Battalion who took over the advance. On 4 September the 2/9th Battalion stalled temporarily, but at 3pm attacked with mortar and artillery support. It was here that Corporal French was awarded a posthumous Victoria Cross for eliminating three Japanese machine gun nests. Next day the battalion struck heavy opposition but after air support by late afternoon opposition had ceased. On 6 September patrols reached Ahioma. That night Japanese ships sank a motor vessel at Gili Gili wharf and shelled the shore line with heaviest casualties in the 2/12th Battalion. The next night enemy ships again shelled the wharf and No.3 strip. On 8 September, the 2/9th Battalion moved back to Gili Gili by sea and were later joined by the 2/12th Battalion. The campaign was over, the 2/9th Battalion had lost 30 killed and 90 wounded, 2/12th Battalion 35 killed and 44 wounded. Of the 2000 enemy who landed, mostly naval landing forces, 700 were killed plus 300 lost on “Nankai Moru” which was sunk by the RAAF. The RAAF Squadrons and the field artillery were crucial to the Australian victory, the first against Japanese land forces in the South West Pacific, and put an end to the enemy plan of a two pronged advance on Port Moresby. Field Marshal Viscount Slim said “it was Australian soldiers who first broke the spell of the invincibility of the Japanese army. Those of us who were in Burma have cause to remember”. 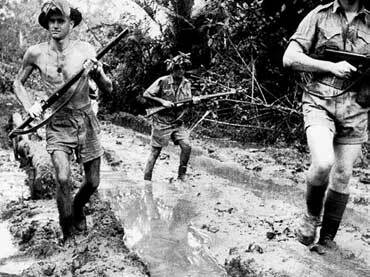 CITATION: At Milne Bay on the afternoon of 4 September 1942, a company of an Australian infantry battalion attacked the Japanese position east of the K.B. Mission where it encountered terrific rifle and machine-gun fire. The advance of the section of which corporal French was in command was held up a by fire from three enemy machine-gun posts, whereupon, Corporal French, ordering his section to take cover, advanced and silenced one of the posts with grenades. He returned to his section for more grenades and again advanced and silenced the second post. Armed with a Thomson submachine-gun, he then attacked the third post, firing from the hip as he went forward. He was seen to be badly hit by the fire from this post, but he continued to advance. The enemy gun ceased to fire and his section pushed on to find that all members of the three enemy gun crews had been killed and that corporal French had died in front of the third gun pit. By his cool courage and disregard of his own personal safety this non-commissioned officer saved the members of the section from heavy casualties and was responsible for the successful conclusion of the attack.